I believe we are moving into an age where people are ready to start stepping into the lives they are meant to live. We all have the power within us to create the life we want, the life we dream about, the life we are born to live. We all have limitless potential that is just waiting to be tapped. We all have the ability to manifest our true destiny. It is our birthright, but we must claim it. We are entering an age where the pursuit of purpose and meaning has become an integral part of our lives. People everywhere are moving from focusing solely on bigger and better, to finding joy in one’s self and eliciting it in others. We are ready to lean into our hearts and our desires to create the lives we are meant to live. So while we are pursuing this life of meaning and purpose, we tend to think about our core values. What is it that empowers you, or that you notice in others that is a trait worth striving for? What is it that you want more of? For myself, I want more COURAGE. Courage is a heart word. The root of the word courage is cor, the Latin word for heart, meaning “to speak one’s mind by telling all one’s heart.” Over time the definition has evolved and become associated with words like “bravery” and “heroism.” But I believe we must also understand that courage requires an inner strength and level of commitment of practice, so that we can speak openly about who we are—the good, the bad, the strong, the weak. Practicing courage is exactly that: it’s a practice. You’re not going to be great at it everyday. But on some days you are courageous, and it’s at those times that I want you to do the happy dance. Being courageous doesn’t mean you don’t feel fear; it just means you walk through it trembling the entire time. I’ve spent a lot of time considering this word because it speaks strongly to me and because I know that COURAGE WORKS! Perhaps that’s part of what my panic attacks have taught me: to walk through the fear and to be curious about courage and how to use it to improve my life. You see, for years I suffered from intense panic disorder. I had trouble doing almost any and everything. Going to work, staying home by myself, going to Walmart, attending a class, or even walking to my mailbox were all huge struggles for me. For me, hundreds of everyday tasks that were easy for most people were super-difficult for me. I was lucky enough to have a very patient mother and an understanding husband who supported me during my struggles. These struggles were real and painful, and I didn’t leave them without some battle wounds. But these battle wounds are part of who I am and they have made me a seeker … a seeker of creating more happiness, chasing joy, and practicing courage in my life. I believe that it is because of our darkness that we pursue the light and that our darkest, deepest struggles become our biggest teachers in the game of life. My panic attacks have become one of my biggest teachers, and they put me on the road of reaching for a higher quality of life. I had and still do have to “badass” my way through them, but the key words here are “badass” and “do.” Because doing means you take action, even though you feel the fear. So practicing courage is huge in my belief system. Being courageous has many meanings and is different for everyone. It means you are willing to put yourself in the arena, you are willing to play the game and willing to risk failure, you are willing to do the difficult, and you are willing to own your life. Practicing courage means taking a stance or standing up for something, even though you may get criticized for it. It means making a major mistake and having all the sweat, blood, and tears that come along with that mistake—then stepping back into the arena, dusting yourself off, and trying again and again and again. It means battling your way through cancer, having a difficult conversation with a friend or family member knowing they may not like what you have to say, deciding to make a career move, attend a different church, being kind to someone who hasn’t been kind to you, signing up for a race even though you’ve never run before, attending an exercise class … or even sometimes it means just walking out your door. 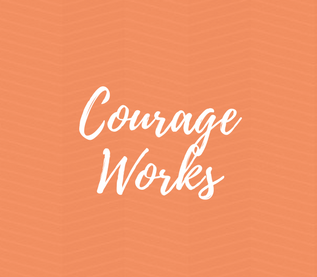 Courage takes many different forms and can be elicited for both big and small tasks because everyone is fighting a different battle. It means that rather than sitting on the sidelines and hurling judgment and advice, we must dare to show up and let ourselves be seen, imperfections and all. Putting yourself in the arena means you might fail at times, but at least you tried. A few years ago, I had the opportunity to witness courage at our high school track field. It was a Sunday evening and we had taken our son, Spencer, to the track to help him practice hurdles and high jump. Well, I had been reading and studying COURAGE, and as I stood on the football field that spring evening, I thought back to my own high school track career. As a freshman, I was winning almost every single 400-meter dash race, my name was in the paper every week, and I was getting lots of attention. I remembered arriving at the starting line and thinking that I absolutely had to win this race or I would be humiliated and want to quit. Well, I was successful that entire season, but as girls mature they get slower and I got slower and when I was a junior and senior I wasn’t winning every race and didn’t want to participate in track anymore if I couldn’t win. By watching this high school boy and knowing that he had the courage to participate in track with his lack of athleticism and all, I realized that he has courage in himself that I didn’t have at that age. This boy was willing to participate in track knowing he would probably come in last every race, but he was still willing to “show up” to participate, knowing he likely wouldn’t succeed in winning a race. But to me, he was succeeding on a level that was a “knock it out of the ballpark” kind of success. On this particular evening, the slow and uncoordinated high school boy taught me a lot about courage and made me rethink the value of this trait and of Theodore Roosevelt’s quote “The Man in the Arena”. This quote hangs in my dining room as a reminder. This boy was choosing to put himself in the arena knowing he would risk failure, and the fact that he had the courage to keep trying is far more valuable than every single race I ever ran and won. A couple of months ago, I witnessed a friend of mine demonstrating major courage. My friend, Tonya, is a huge animal advocate like me. She is bold and strong and stays true to her authentic self and her belief system. She’s never afraid to speak her mind, and she’s absolutely 100% willing to take action on things that she disagrees with. For example, we were involved in an animal rescue mission with a dog that had been left outside in a major snowstorm with no shelter. Tonya showed tremendous courage and was willing to do whatever it took to try and save this animal. She was willing to make a video explaining the situation and to let her voice be heard. She boldly stated her opinion on the matter. Unfortunately in this particular case, the animal was sent back to its owners and there was a lot of controversy over the matter. But I was absolutely moved by Tonya’s perseverance and unwillingness to betray herself or her integrity. Watching her put herself and her voice out to the world via Facebook videos made me once again, rethink this practice of courage. She made me think that maybe I can practice even harder. I see people every darn day practicing courage and I’m inspired by it. At times in my life I feel like I’ve chosen courage over comfort. Not always, but I do try to make this a practice in my life. Because of this practice, that means I have had to swim through turbulent waters and endure the repercussions of my actions even when my actions revolved around my own integrity. I’m actually quite proud of my courage at times, and when I don’t act courageous, I feel like I’ve betrayed myself. And trust me … I don’t always act courageous, nor have I always acted out of integrity, but it’s always on my radar to try and practice it. So, I ask you: what is it that you are afraid to do? And then, do you have it in you to at least try? Are you willing to feel the butterflies or even that sick feeling in your stomach? Because if you are, I can tell you it will open doors for you that you never thought imaginable. When a person dares greatly, opportunities begin to enter into your universe. Are you going to fail? Yes, you are. But at times, you will also succeed. And as I always say, every mistake is really just an opportunity to learn and grow from—and that’s the most important part of the mistake. I’ve made a lot of mistakes in my life, but the bigger the mistake the bigger the lesson. You are going to make mistakes in life and you are going to experience failure, but I believe it’s worth it and that COURAGE WORKS. We never know where the edges are if we don’t fall off of them every now and then. We will never know what we could have accomplished if we had just tried. The important thing is to be willing to be uncomfortable in order to create a better YOU than you were before. We are all works in progress, and it’s part of the human experience. But remember it’s important to sometimes take risks knowing you might fail. It’s what the great thinkers of our world do. They persevere in their failures and end up making it because of them. Think Steve Jobs and Bill Gates. Bravo! WONDERFUL! I have found these truths in my life. Thank you,Kim, for speaking your heart! Good job buddy! I like you verbiage and the opportunity for others to read and then think about their life and how they are living ( or not living) to their potential! You will do great things Kim! !